Gallipolis Planning Commission members discuss concerns with placing a men’s drug recovery program next to a women’s shelter. From left to right are City Manager Gene Greene, Planning Commission member Marvin Ours, City Commissioner Mike Fulks and Planning Commission member Troy Johnson. Not pictured is Planning Commission member Fred Wheeler. GALLIPOLIS — The Gallipolis Planning Commission, Wednesday evening, approved a two facility site plan for the Timothy Project, a faith-based men’s substance abuse residential recovery program, aiming to occupy two old Middleton Estates buildings but not for Serenity House, an area women’s shelter, which was also seeking the use of two neighboring buildings. The buildings are located respectively at 8202 Cliffside Drive. According to city officials, the area in which the two programs wished to base their programs is zoned as a community service district area and were seeking a conditional use for boarding and rooming structures. As per Gallipolis ordinances, that requires the submission of a site plan which describes structural details, easements, boundaries and descriptions of use of the property site, among other things and the planning commission either approves or denies those plans. 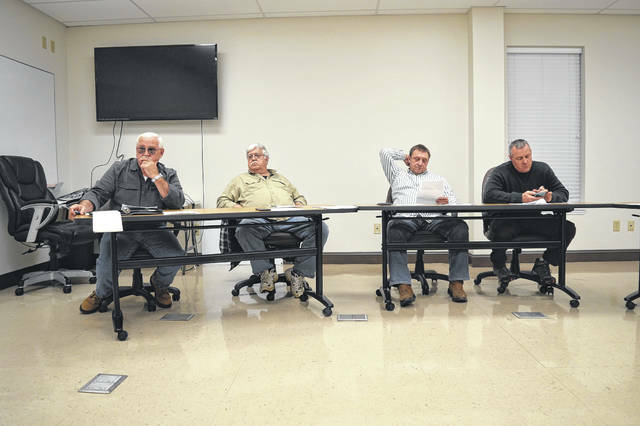 Present on the commission at the meeting were Gallipolis City Commissioner Mike Fulks, planning commission member Troy Johnson, Marvin Ours, Fred Wheeler and City Manager Gene Greene. Greene and Fulks are also considered planning commission members. Representing the Serenity House was Executive Director Pamela Riley and representing the Timothy Project was Executive Director John Nee. Serenity House Manager Codette Oshel also spoke at the meeting. According to meeting discussion, Middleton Estates is a state-owned property. Serenity House representatives said they previously had favorable discussions with the Ohio Department of Developmental Disabilities about potentially acquiring the property. In comparison to its current undisclosed location, Serenity House said its residents would have more privacy at the Cliffside Drive address and could potentially house more women and their children seeking to rebuild their lives after escaping domestic violence and homelessness on the road to self-sufficiency. Serenity House services southeast Ohio although occasionally has a resident seeking to escape a hazardous situation in their home county entirely. Fulks and Greene voiced concerns with placing a men’s rehabilitation program next to a women’s shelter as well as being near the Cliffside Golf Course and its traffic. Both programs planned to utilize different structures next to the other. Greene answered that the buildings did not as they had no water service at the time and it would potentially take around $10,000 to facilitate lines to the structures and the women’s shelter had no certificates of occupancy. Riley said not at the moment but that would be rectified with updates to the buildings. “There’s issues that you’re discussing that we can’t do anything about until you okay it,” said Riley to the commission. Greene said there had been a sudden influx in recovery programs within a few miles of Gallipolis over the last few years. He asked why would there need to be another in the area. Nee replied that he felt the Timothy Project could benefit the community as it would serve as a “abstinence” faith-based recovery program. He said the organization utilizes no drug treatment options such as Suboxone. The project serves residents from outside Gallia, however, Nee said the program had been operating in the region for two years and had not had a strong response from locals seeking support. It would ideally like to focus more on Gallia needs. City officials in the past have voiced concern with a rise in addiction recovery programs coming to Gallipolis. If an individual not from the area were to fall out of recovery and return to substance abuse, officials were worried it would mean added problems to crime in the area if he or she stayed. Nee stated that if residents were identified to be a problem in the program, they were quickly taken to a bus station and given a ticket to leave the area. Robbie Jacks vouched for the program saying he had worked closely with the group and felt residents who might become a problem tended not to linger in the county. Riley said the Serenity House had been offered the option of taking residence in all four structures at Middleton Estates but had heard another program was seeking space. “We’re just trying to work together with the community to provide as many services as we can to the community,” said Riley. Commission members said they felt the Serenity House filled a vital role in the community but they felt the proposed Middleton Estates location was not ideal. Commissioners ultimately voted down the Serenity House site plan. Marvin Ours was the sole member to vote yes. “I think we all wish you well, there’s absolutely a need and I understand the position you’re in,” said Fulks. Riley became emotional and said she didn’t feel planning commission members did understand before leaving the room. “Regardless, you’re taking a place where they want to be private and away from everyone and stick them on the edge of a golf course where there’s tens of dozens of people…,” said Fulks. Commission members approved the Timothy Project site plan with all members voicing approval, save Greene who abstained from the vote. The project was approved with the condition that city officials would return to note the project’s progress later and that no major incidents occurred requiring law enforcement attention.